One aspect of Doctor Who that I haven't really touched upon this year is the visual style. This is partly because there is a general tendency to view television as less visual than film since it's a writer-driven medium rather than director-driven one. This is more than a little wrong-headed, obviously, because they are so similar, but the quicker production schedules and generally lower budgets of television means that it takes something special - a Breaking Bad or Game of Thrones, for example - to really stand out as something that needs to be discussed in terms of its direction. It's also in part due to the fact that, as I've mentioned in the past, the show maintains such a generally high, professional sheen over everything that it's rare to see something that really stands out as exceptional about the way the show is put together. Generally, it's the performances and the writing that draw the attention, not the direction. There are, of course, exceptions to every rule, and unfortunately for Doctor Who, the visuals and direction tend to only deserve much comment or consideration when they are egregiously bad. This episode was one such example since it was a case of sloppy execution undermining a strong script, interesting concept and fine performances. The only thing that kept it from being probably the best episode of the current run was that it seemed to be put together in such a slapdash way. Picking up where "The Crimson Horror" left off, with Artie and Angie, the two children Clara nannies for discovering that she is a time traveller, this episode begins with The Doctor taking the three humans to Hedgewick's World of Wonder, a kind of decaying galactic funfair which has fallen into disrepair and is now occupied by a small military unit. It also plays host to a group of deactivated (*wink wink*) Cybermen who remain as museum pieces to commemorate the war in which the Cybermen were exterminated (*WINK!*). Aside from the military personnel, the only people remaining are the proprietor, Webley (Jason Watkins) and Porridge (Warwick Davis) a chess champion who operates a Cyberman who has been converted into a chess playing machine. They do their best to show the humans a good time, but The Doctor discovers some strange insects scurrying about the place, and he decides to keep everyone around long after they have exhausted the meagre wonders of Hedgewick's world. He tells the kids that they should stay put - because there's absolutely nothing to worry about - but his advice falls on deaf ears, and it's not long before Angie, Artie and Webley have all been infected by the insects, which are actually Cybermites, disgusting little organisms which reactivate the Cybermen and take over the bodies of those they infect. And that number soon includes The Doctor. Easily the best parts of the episode came from the scenes in which The Doctor, post-infection, does battle with the creature trying to take over his mind. As in "The Crimson Horror", it was fun seeing Matt Smith play a different variation on his manic persona, and I have a soft spot for any story in which an actor has to argue with themselves convincingly. 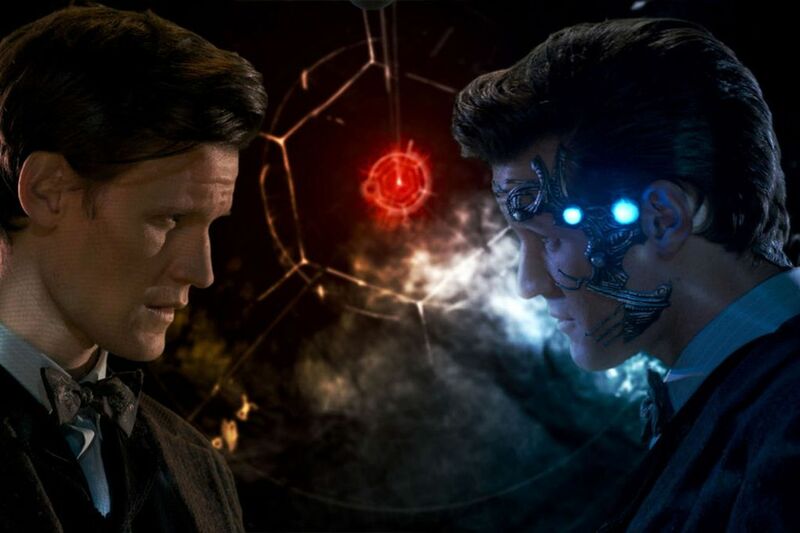 As both Time Lord and malevolent program, Smith seemed to be having a great time, particularly during the scenes which took place entirely inside his own head. (Visually, these scenes were also a highlight of the episode since they reminded me of the work of Dave McKean, though I'm not sure if I made that connection because the episode was written by Neil Gaiman, who has frequently collaborated with McKean over the years). If the whole episode had just been Matt Smith trying to outdo himself, it would have been great. Unfortunately, the episode had to move away from the internal conflict to be about Clara leading the military in their attempts to fend off the encroaching Cybermenace. While it was fun seeing Clara weigh up which of the ridiculous rides might be the best place for defense, and she got to play at being a leader in a way which was interesting and different, that whole half of the episode felt rushed and undercooked. The action scenes, such as they were, were brief and hurried, and they never quite established who any of the soldiers were surrounding Clara, so it was hard to get that worked up about the question of whether they lived or died. This issue stemmed from the script, and it certainly seemed as if Gaiman, given his penchant for writing brilliant, twisted men who live inside their heads, was probably more interested in The Doctor stuff than any of the fighting, but it was also a problem of execution. Stephen Woolfenden's direction was pretty quotidian, and never really rose to the material in the way that Richard Clark managed to when he directed the earlier, superior Gaiman episode "The Doctor's Wife". The pacing of the episode seemed massively unbalanced, with too much time spent on the early scenes of the group enjoying the park and too little time spent on either the conflict or resolution of the story. There's something to be said for having too many ideas, and the show should be applauded for trying to be a bit bolder in its storytelling, but in this instance the desire to cram as much in seemed to hurt the story more than it helped it. Speaking of resolution, the episode wrapped everything up in a way which was pretty neat and went some way to clearing up the messiness of its middle act. The Doctor challenges himself to a game of chess, with his fate and those of his friends in the balance. As Clara and co. are being attacked by the Cybermen, an enemy they are ill-suited to fight, The Doctor makes a move which he insists will lead to checkmate in three moves. The Cyber-Doctor can't see how it's possible, so he starts to draw upon the processing power of this fellow Cyber-Beings, causing them to shut down and give the humans time to escape. The Doctor uses a special electrified glove to shock the interloping tech attached to his face, breaking its hold over him, and Porridge reveals himself to be a lost emperor (Seriously, there was a lot going on in this episode) and gets his flagship to beam them all to safety while the planet is destroyed by a fail-safe mechanism. As far as endings go, it's not the worst one Doctor Who has ever done, but it does illustrate everything that was off about this episode. There were some fun characters, some very good dialogue and plenty of individual moments which worked, but it never seemed to get much momentum going, and the ending felt like something that was thrown in to tie every loose end up in the least amount of time because the rest of the episode seemed too busy to make room for a proper resolution. More than any other episode this year, "Nightmare in Silver" was not necessarily good or bad, just maddening, because it has so much potential, almost none of which amounted to anything, which pretty much sums up the half-season as a whole. - Jason Watkins is one of those character actors who crops up in everything, but I know him primarily from the first series of the UK version of Being Human, in which he played the Big Bad, a truly psychotic vampire named Herrick. As such, I spent the first ten minutes of the episode thinking he was going to be villainous all on his own, rather than through coercion. - Eve de Leon Allen and Kassius Carey Johnson, who played Angie and Artie respectively, were both pretty good in roles that could have been precocious and annoying. I just hope that the show doesn't bring them in too often, because the last thing Doctor Who needs is to go back to the era of roping the Companion's extended family into every adventure. - Having said that, Johnson's attempts to make floating look like the most fun thing ever were...less than stellar. Allen was much better at pretending to be unimpressed, which suggests that irony is way easier to play than earnest.